GREGORY WILPERT: Welcome to The Real News Network. I’m Gregory Wilpert joining you from Quito, Ecuador. 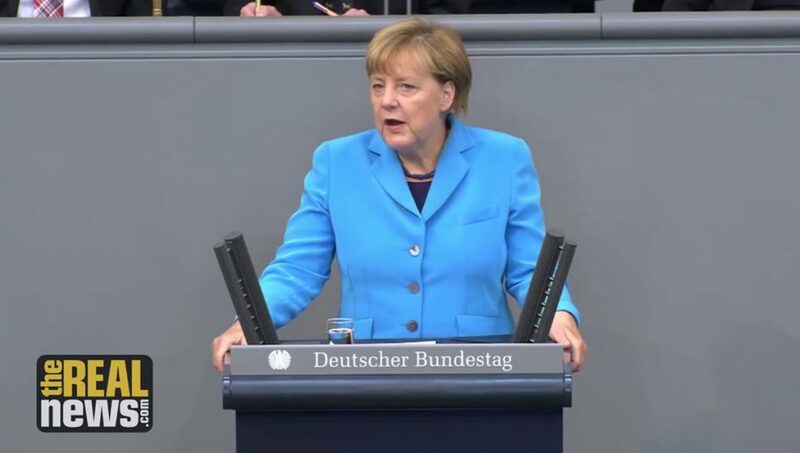 Finally, almost five months in Germany held national elections last September, Germany’s two largest parties, the Christian Democrats and the Social Democrats agreed to form a coalition. However, the deal is not finalized yet because the Social Democratic Party decided to allow it’s 470,000 members to vote on whether or not to accept the Coalition Agreement. The vote conducted via mail and ballot ends of May 4th. In the Coalition Agreement, the Social Democrats managed to get one more ministry than they had in the previous government, for a total of six ministries, including the high influential ministries of foreign affairs and of finance. However, there are rebellions developing both among the CDU and the SPD membership against this agreement. Joining me from Berlin to analyze the complicated post-election situation in Germany is Victor Grossman. Victor is author of Crossing the River: A Memoir of the American Left, the Cold War, and Life in East Germany and writes regularly about German politics for a variety of progressive websites. Thanks for being here again, Victor. VICTOR GROSSMAN: It’s good to be with you. 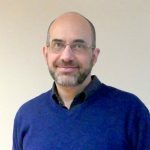 GREGORY WILPERT: So first, can you tell us what are some of the main elements of this coalition agreement and what way would Germany be heading, policy wise, if the agreement is finally signed in May? VICTOR GROSSMAN: It would not be such a different path than it’s been following for the last four years because it would be simply continuing the same coalition between the Christian Democrats and their Bavarian sister party, like we shouldn’t forget them, and the Social Democrats. They’ve been at it for four years and for those four years, they have not been able to satisfy a large number of the German people, which meant that they took a big, big loss in the September elections. But they’re still trying to cement some way to keep it going these four years. The Social Democrats at first said, “We don’t want to continue this coalition because we lost so many votes that it’s suicidal if we keep it up.” But then every other possibility practically disappeared except for new elections. And nobody wants new elections, they’re afraid of them because the far right could win. So, they tried and succeeded last Wednesday in working out a long, long program with how many pages was it? 170 pages I think, and are hoping that they’ll get approval. The Christian Democrats although they are not always happy about it, they have approved because they just had a Congress. But the Social Democrats are having this Referendum, and it’s not at all sure or certain that they’ll get a majority of their membership to approve the program. And if they don’t approve it, if they don’t get a majority, it means starting all over from square one after five months of haggling, they’ll have to try something else. GREGORY WILPERT: Well, as you mentioned, the Coalition Agreement is being hotly contested within both of the parties that are supposed to sign it. Let’s start with SPD, the Social Democratic Party. It’s leader, Martin Schulz, is stepping down from the party leadership and now it turns out he’s not taking the foreign ministry which he’d originally announced that he would. So, just tell us a little bit about what’s going on. Why is he stepping down and why is this agreement so controversial within the SPD? What he did was, in these long negotiations which lasted for weeks, he grabbed the foreign ministry post for himself, which of course has lots of prestige. He simply grabbed it and now there’s been so much disagreement on that, that he was forced to step down. But in the meantime, in the hopes of getting foreign ministry, he had already given up the job of Chairman of the Party. And now he’s lost that too. So, nobody knows what’s going to happen to him. They may just put him out to pasture like an old cow. He’s unpopular with everybody I could add. GREGORY WILPERT: And so, what about the CDU, the Christian Democrats. Merkel seems to have conceded quite a bit on giving the SPD another ministry more, one more ministry than previously. Why did she do that and what do you think this means for her own future? VICTOR GROSSMAN: First of all, Angela Merkel was under pressure. She was under pressure from the Social Democrats because they have to sound at least as if they’ve really won something. Otherwise, they won’t win this Referendum. They have to convince their own membership that they really achieved something. So, she was under pressure from basically sort of the left, they’re not very left, but sort of the left. But on the other hand, the Christian Democratic Party has this sister party, which is only in one state in Bavaria, that’s the biggest state though. They have their own separate little, they call it Christian Social Union and they are under terrific pressure because they are heading in to a state election in October. And therefore, they couldn’t make any concessions to the left, so that she was caught in the middle. And at the same time, she had to bring these two opposites together otherwise the whole thing would collapse and her own position as head of the government, which she’s had for 12 years but she wants another four years, this would be in peril. If she didn’t get an agreement, her own position would be in danger. So, that especially Angela Merkel did everything she could to satisfy both this sort of leftish Social Democrats and this very rightest Christian Social Union and make compromises in terms of ministerial jobs, in other words, cabinet posts. She got a compromise on both of them. So, the man from Bavaria is head of the interior ministry, which is very strong. And the Social Democrats have not only the foreign ministry, but they have the finance ministry, which is the one that governs the whole economy basically. She just had to make this compromise. However, she’s still pretty strong, but she’s under attack also within her own party, who think that she’s gone a little too, been a little too liberal for them and they’re very far to the right. GREGORY WILPERT: Tell us a little bit of what this means in terms of the polls. I mean, it seems like it’s not for certain and you mentioned this earlier, that the SPD membership will vote for in favor of the Coalition Agreement, in which case, there would be new elections perhaps as early as, I don’t know, May or June. If that were to be the case, it sounds like both the SPD and the CDU, because of their internal conflicts and because of the pressure from both the left and the right, means that they would lose some votes. What’s the trend right now and what do you think this would mean also for the far right part, the Alternative For Germany? VICTOR GROSSMAN: That’s the key question because if they do not reach some kind of an agreement on this coalition, which is in danger because of that Referendum. If they don’t, almost the only alternative, there are two alternatives. One would be to have her run a government without a majority, without half the seats, which is very rickety. And she doesn’t want that, to be sort of, go asking for help from the other parties at every decision. No, the main alternative would be new elections. And with new elections, both the Social Democrats and the Christians are very much afraid that this AFD, this Alternative For Germany, might gain even more than it already has. It has now 92 seats in the Parliament, the Bundestag, which is something over 700 in all. They have 92 seats and they’re far, far right. Some of them are almost open fascists. They still honor the exploits of Hitler. They don’t say it quite that clearly, but they are. They’re far to the right. They’re basically a racist organization. Their main key program is hate the muslims, hate the muslims, hate Islam. And they’re extremely dangerous and not only that, but they’ve been siphoning off votes from all the other parties. So, they’re all scared of a new election that they may, they’ve already lost a lot, that actually this AFD got about 13% in September. If it gets 14%, which is what its standing now in the polls or even more, this would make the whole situation in Germany even more dangerous than it already is and it is dangerous because all around Germany, especially in Austria, but in other countries, this far right based on hate the Muslims, that’s not their main, that’s their slogan. But actually they’re out to really have an authoritarian dictatorship of the right and they’re extremely dangerous. And they’re gaining ground and if Germany were to fall to them, it’s not only central, it’s the main force in Europe. It would be a very dangerous situation. And I think the Christian Democrats are trying to sound far right enough not to lose anymore votes to them. The Social Democrats are sort of wobbling. They’re afraid of losing them too, and the left party is also afraid of losing votes to these people on a basis of hate, hate the foreigners, hate the immigrants, hate the muslims, which unfortunately gets votes in many countries. GREGORY WILPERT: Well actually, I was going to turn to that next, to the situation of the left party, Die Linke. They got a little over 9% in the last election, and I mean, sometimes one says that if the center party, that is the Social Democrats and the Christian Democrats are failing, that both the far left and the far right could perhaps gain from it. What’s the situation with Die Linke, the left party? I mean, why aren’t they in a position to benefit from this political turmoil that’s going on? VICTOR GROSSMAN: That’s a hard question. They are now standing at about 10%, which is a little less than the far right party. It’s a little less than the Greens, which are pretty far right here also. And another party, Free Democrats. In other words, instead of being the main opposition party, which they were up, for the last four years, they would be in the fifth or sixth place or even seventh place. Why haven’t they managed to get any stronger? I think there are several reasons. First of all, there are lots and lots of prejudices against them, especially in Western Germany, as a far left party, which still based on the old east German system, which is not really correct anymore. But still, there are many prejudices, but more important than that I think, and more worrisome to me, they have not really managed to develop a real fighting spirit outside of the Bundestag. They take many good stands against war, it’s their main stand. A peace stand, against war, to say that Germany should not engage in foreign conflicts like Afghanistan or in Mali in Africa or elsewhere. And a lot of people agree with that, but still they have not been able to demonstrate that they’re fighting and they stand for, a very good program of housing, of cutting rents, of improving life for children and many other ways. And especially for keeping the peace, for not sending weapons to all kind of, lots of these countries, which are amidst of a war. They have not been able to convince many people of this. And on the other hand, the right wing group has been able to reach a lot of people by saying, “All the old parties, they haven’t achieved anything. There is very little hope for the future. What’s going to happen to your children? They’re not going to do better than you are. Things are getting not better, but worse. We don’t want any of the old parties.” That’s actually where the left party, Die Linke, should have moved in and won lots and lots of votes. It did improve just a little but it’s still stuck around that nine or 10% and can’t seem to get out of it. Partly also, I must say, because there’s lots of quarreling like in the other parties, there’s lots of quarreling and bickering within the left party about which position to take. Which direction to move on many questions. GREGORY WILPERT: Okay. Well, I’m afraid we’re going to have to leave it there for now. I was speaking to Victor Grossman, author of Crossing the River: A Memoir of the American Left, the Cold War, and Life in East Germany. Thanks again Victor for having joined us today. GREGORY WILPERT: And I’m Greg Wilpert for The Real News Network.